Thanksgiving is more than just a day–it is a time when we can come together and give thanks, be hopeful and enjoy those around us. Celebrate the season with 7 free and for purchase Thanksgiving themed cross stitch patterns. What are you thankful for? Family and friends? Your ability to cross stitch? No matter what you are thankful for; you can celebrate with this Be Thou Thankful sampler from Free Patterns. You can customize this pattern for the current year. Go a step further and change the color of the house to match your own. This pattern would be a wonderful gift for newlyweds or a new home owner. Think outside the box with this pattern–create a wall hanging or a wreath for the person in your life you are most thankful for. Add beads, ribbon and other accessories to add dimension to the final project. You can also use this pattern for mason jar covers and greeting cards. Who is the star of the Thanksgiving show? It's Tom Turkey, of course! Alter the pattern a bit by cross stitching it on large canvas plastic and use the finished project as a trivet for Thanksgiving dinner. The pattern would also look great on napkins or as a large cross stitch in the middle of a table cloth. The first Thanksgiving is nothing like the holiday we celebrate now. There was no Macy's parade and no football. What they did have was each other and a hope of making it in a new world. Celebrate those English settlers with Lizzie Kate's Pair o' Pilgrims. The man and woman pilgrim pattern are stand up cross stitch patterns that would look wonderful on a mantle or as a centerpiece at the Thanksgiving table. While we should count our blessings every day, autumn, and in particular Thanksgiving, make us count them even more. 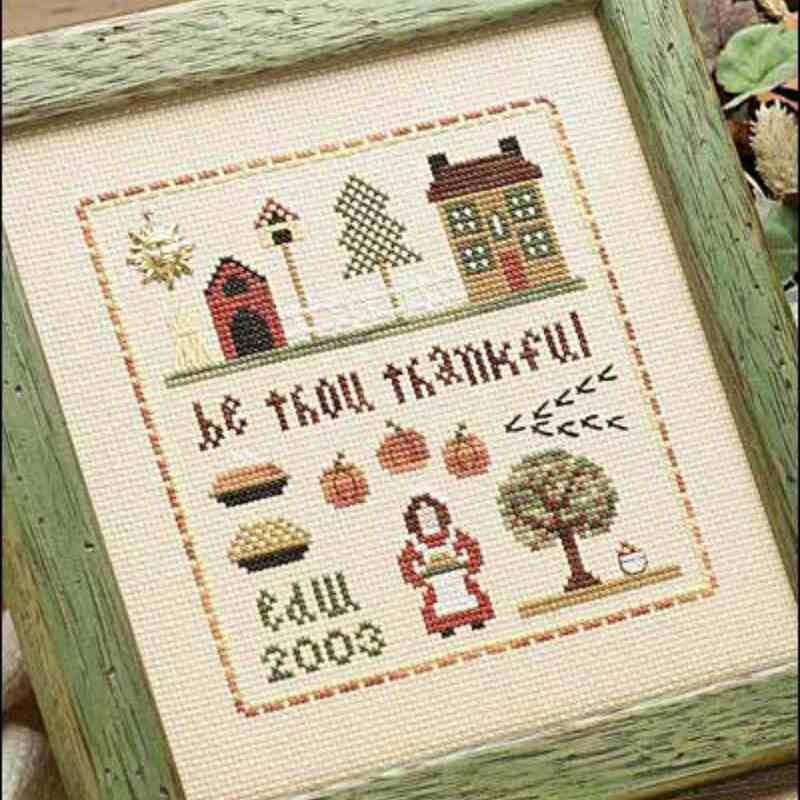 Cyber Stitchers offer a free Blessing Abounds cross stitch pattern that reminds us to be grateful for the bounties in our lives. Hang your stockings on the mantle for Thanksgiving. What? That's just crazy! Take an old holiday tradition, mix it with primitive cross stitch patterns and create a new decorating idea. His and Hers Thanksgiving Stockings are sure to be the center of attention in a beautiful Thanksgiving themed mantle display. If you want to take it an additional step, add a scented sachet to the stocking. Sometimes you do not need to go over the top with a message. This cross stitch pattern by Bev's Country Cottage makes a very simple, yet strong statement. This pattern is free for download and would make a great project for beginners. Have friends over for a fun Thanksgiving themed craft night that includes a make-and-take with this pattern. You can customize it even more to include friends and family member's names or include what you are especially thankful for.